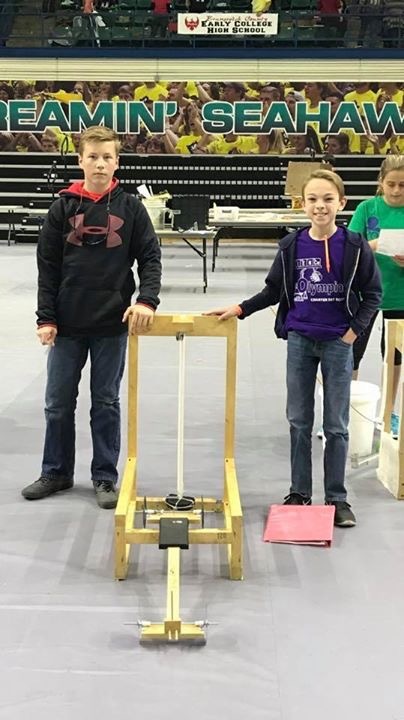 Charter Day Middle School Students scored top ten rankings in 5 separate competitions at the regional Science Olympiad competition held at UNC-W on March 4th. • Students are tasked with using their knowledge of physics and engineering to build structures entirely out of duct tape, ex. Tallest tower, most buoyant boat, strongest bridge, etc. • Students direct the beam of a stationary laser pointer around obstacles to a target using only a set number of mirrors. Charter Day School (CDS) is a K-8 tuition-free charter school in Leland. As charter schools have the freedom to offer alternative curricula to state-mandated educational programs, CDS opts to provide a unique classical curriculum. CDS currently provides both the top-scoring elementary and middle schools in Brunswick County on state End-of-Grade tests. Two teams—a JV and Varsity—represented the school in Science Olympiad competition. Teams divided into groups of two or three students and competed in each category, placing in the top 10 of 40 schools in these categories. This was CDS’ sixth year in competition and the second year of competition for CDS’ sister school, Columbus Charter School, (CCS) located in Whiteville. CCS offers an identical educational program to that at CDS and also provides the top-scoring elementary and middle schools in its county— Columbus — on End-of-Grade tests. The educational program in place at both schools is provided by The Roger Bacon Academy, Inc. (RBA), an educational management company that provides curriculum, support, and administrative services to public charter schools. The RBA family of schools also includes Douglass Academy in downtown Wilmington and South Brunswick Charter School in Southport. CDS Science Olympiad teams were coached by 7th grade science teacher and winner of the 2016 Ann Watkins Distinguished Middle School Teacher Award from the NC Science Teacher Association, David Johnson. Mr. Johnson is assisted by fellow teachers Jonathan Urban, Nicole Fine, and Sarah Gardinor.